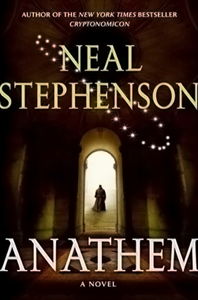 I’d recently finished reading “Anathem” by Neal Stephenson (one of my favourite authors of speculative fiction). The book was a little difficult to get into as it was set in a quasi-earth-like future civilisation with a somewhat similar but different vocabulary. However, once I got past the initial learning curve of the new language, the story flowed quite well. A word that I really liked from the book was – “concent” – describing a place that is part convent and part concentration camp. Anyway, the main idea that the author played with was religion and science. I liked the way that the two are so closely linked and intertwined in the story. My main takeaway was the very definition of consciousness and how quantum mechanics plays a role here. In QM, an electron can exist in either one of two states. Which state it sits in depends on observation. This is applied to the many-universe theory where we are constantly caught between multiple possible outcomes, which only collapse onto the present when observed, and our consciousness acts as the observer. That’s why I like his books. I wonder if REAMDE will be any good. I won’t be able to read it for a while though.